Bell & Gossett Compact Heat Exchangers are ideally designed to satisfy the heat transfer requirements of any number of industrial applications and are immediately available from factory stock. This means that there is no long wait for delivery once you give your Bell & Gossett representative the system requirements. Simply let your Rep know what you need, and Bell & Gossett will computer-select the right unit for your particular requirements. 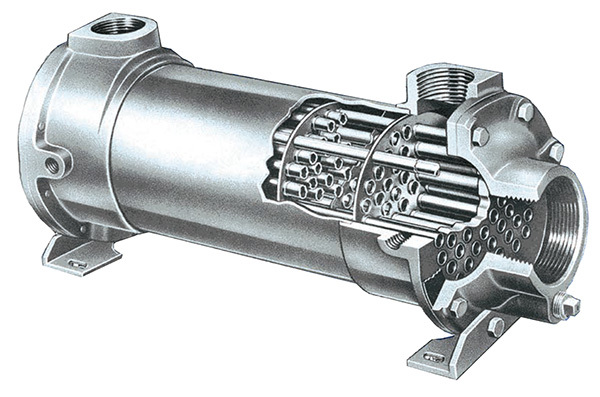 Bell & Gossett CHX heat exchangers in addition to being immediately available incorporate advanced design techniques. Each unit has been computer designed to be the best size for the job. Angular baffle cut design prevents shell fluid short circuiting, insuring maximum heat transfer for your investment. Bell & Gossett designs are matched in quality by advanced manufacturing techniques. Unit components are precision die formed to insure an extremely tight fit.